Check out the BEST burger that you will ever put in your mouth! The Q Burger only Wells! This thing features Lee Wells super fresh farm to table meat and SIDEWAYS Award winning Brisket and pickled onions then topped with Wells special BBQ Sauce! Served only on Tuesdays from 5:00 to close and only at Wells! This thing will blow your mind! 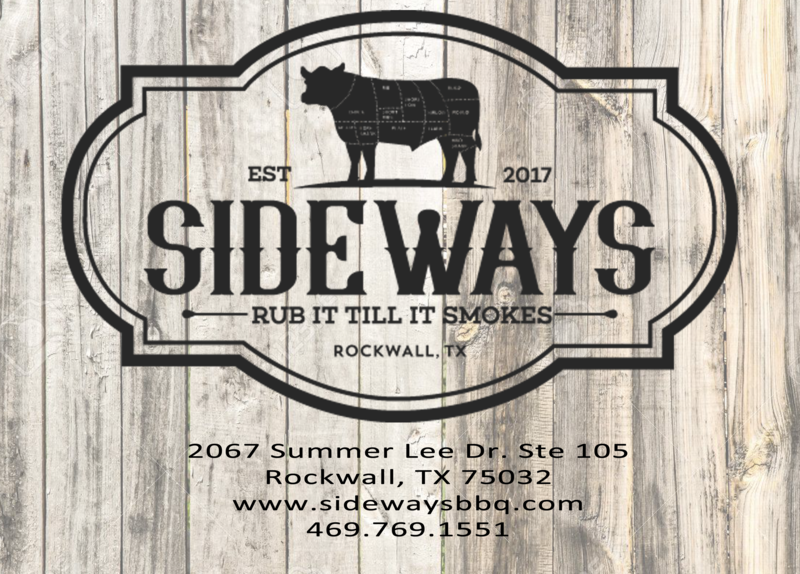 You have to come on Fridays to Sideways BBQ in Rockwall. They serve the BEST Beef Dino Ribs & Brisket Taquitos! Burnt Ends Wednesday at SIDEWAYS Today! You have to try these little morsels of greatness!!! FREE RACK OF BEEF DINO RIBS!!! An entire rack!! Sideways will be giving it to a LUCK person Next Tuesday 1/11. Eat em at Sideways or take em home. Sideways will be doing a random draw Monday at 5:00 PM. You must Follow Sideways on Facebook and Tag 3 people. Good Luck! SIDEWAYS- Today’s Specials are Beef Dino Ribs and Brisket Taquitos! You have to try both! You will absolutely LOVE THEM!!!! BEST BBQ in Texas!!! Today is Burnt Ends Wed at SIDEWAYS! Also Karaoke tonight!!! Best Restaurant EVER! Dino Beef Rib Tuesday! Better get em before they’re gone! CLICK>> www.rockwallchambervotes.com VOTE for Sideways as the Top Emerging Business of the Year! Happy Hour specials Tuesday thru Thursday 2:00-6:00 $1.00 off all well drinks and $1.00 off all draft beers!!! Avocado Bacon Bombs At Sideways are sooooo dang good! Wait till you try one of these things. You’ll be hooked! Sideways is one of the drop off points for TOYS FOR TOTS! If we win we get a cash prize for the most toys. We will then donate that money back! So help us win!!! Visit Sideway's profile on Pinterest.